BELGRADE, SERBIA: Local name of Belgrade is “Beograd” which means the “White City”…not sure how the capital of Serbia got its name, but it is one of the diverse metropolitan and booming cities in the Eastern European Bloc. The city was shaped by unique characteristics of Ottomans and Austro-Hungarian emperors. After the formation of Kingdom of Yugoslavia, Belgrade became the capital of the whole federation. And it stayed as the capital of Serbia after Yugoslavia broke into smaller countries. While it may not be a typical European touristic spot, the city is an energetic and a thriving place with lots of things to do and see. TIME of TRAVEL: This is a bit sad that Belgrade was our last trip in Europe in airplane before leaving for our home in the US. We will take few more trip before leaving Belgium but those will be all by road. We flew to Belgrade end of May, 2014. Fortunately, we had a stopover in Rome, Italy for few hours and we managed to take a taxi to Rome city center and got to spent little more than two hours. It was nice to go back to the Eternal City after more than two years and pass by Trevi Fountain, Pantheon, and Piazza Navonna one last time. The weather in Belgrade was good, pleasant during the day and slightly cold in the evening. Luckily, we got no rain. OUR HOTEL: We stayed in Hotel Srbija Garni, about ten minutes’ walk from Knez Mihailova Street. The hotel is by a big street (Bronkova) surrounded by some old buildings and many restaurants/fast foods. We had free good quality breakfast buffet and Wi-Fi. Although we didn’t have any car with us, the hotel provides parking garage for its customers. The people were pretty helpful giving us all the information on the city and what to do and see in Belgrade. Our room was pretty spacious too, decorated with contemporary and trendy furniture, art décor, and clean linens. I would recommend it to anyone visiting Belgrade. EATING and SHOPPING: Serbian food is very similar to Turkish food, just like other Balkan countries. Since we made a big Balkan tour last month during the Easter Break of 2014, we mainly had pizza, Chinese, fast food in this trip. Skadarlija is a fantastic place to try local dishes in an alluring atmosphere. 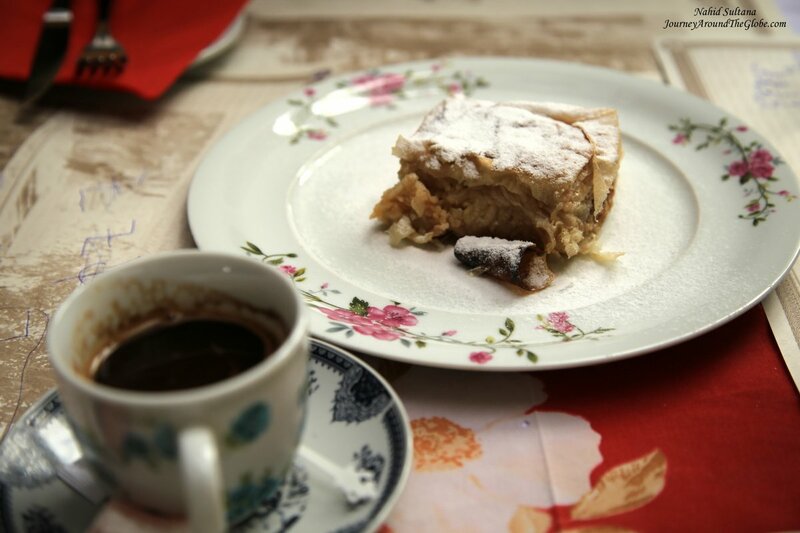 We had Serbian coffee (again, very similar to Turkish coffee) and a slice of apple pie in a restaurant called Zlatni Bokal. Our last lunch in Belgrade was in a good Serbian place near our hotel. I can’t remember its name but the food was delicious for its price. We had fried cheese, fish soup, grilled trout with spinach and potatoes, and baked fish. What we saw in other Balkan countries is true in Belgrade too…food is very reasonable and cheaper than western European countries. You can get big dish of quality cuisine for around 7/8 euros in decent restaurants. Entrance to Belgrade Fortress from Knez Mihailova Street is a good place to buy souvenirs. These are small carts that sell some attractive local trinkets for good prices. We bought a ceramic vase with two Serbian dolls embossed on it and a set of glass jars hanging from a wooden holder. They both were under 12 euros each. Other than these, Serbian dolls, ceramics, wooden bear/water bottles are very traditional of this country. 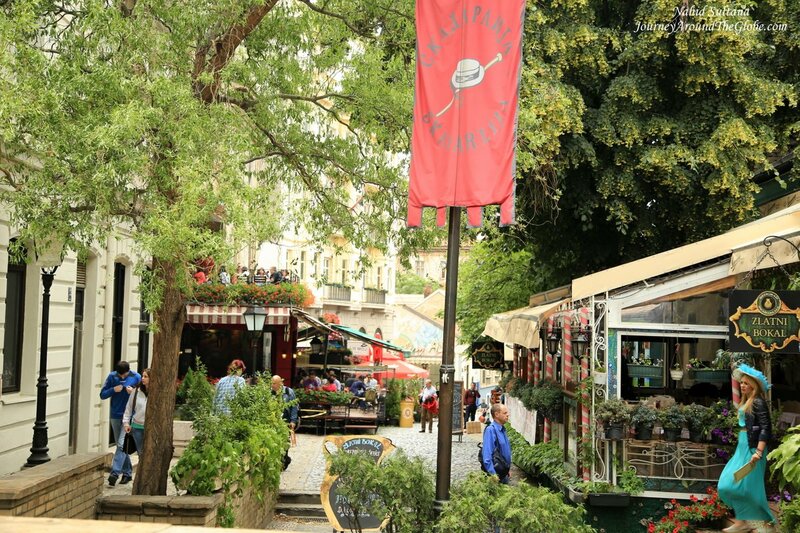 You will find some carts on Knez Mihailova Street too selling t-shirts, post-cards, and small stuffs. 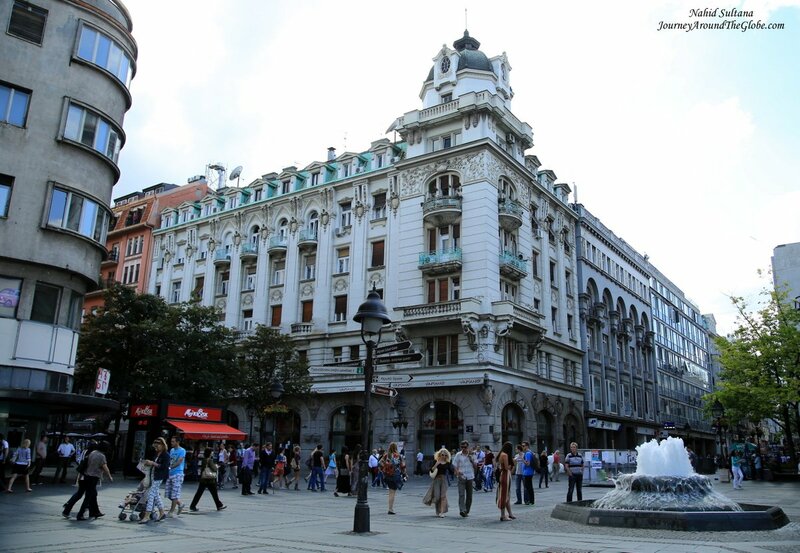 PLACES WE’VE VISITED: We spent almost 2 ½ days in Belgrade. Honestly speaking, we could be done with all the things we wanted to see in about a day or little more and may be keep another day to make a daytrip to nearby somewhere. But our little girl fell sick and had high fever during this trip, so we decided to take it slow and do little a day. On our first day we visited Knez Mihailova Street, Belgrade Fortress, Belgrade Cathedral, and Republic Square. Day 2, we took a taxi to St. Sava Cathedral, then to St. Mark’s Church, Nikola Pasic Square, and Skadarlija. Last day our flight was in the evening, we took a taxi from our hotel to Tito’ Mausoleum and House of Flowers and that was it for that day. 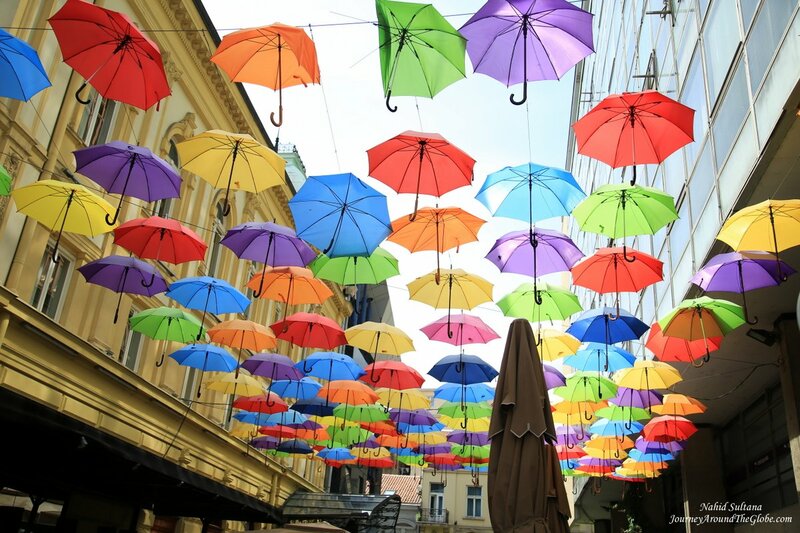 One of the place we could have gone to was Zemun district which is supposed to be a nice place to hang out that has plenty of restaurants and pretty neighborhoods. Moskva Hotel is a historic building which once was the Russian house at one point. If you are interested in visiting church, most (if not all) of the churches in Belgrade were built 1931 and later. Other than the churches I’ve listed below you can also visit Church of St. Alexander Nevsky, Church of Holy Virgin, and Monastery Rakovica. 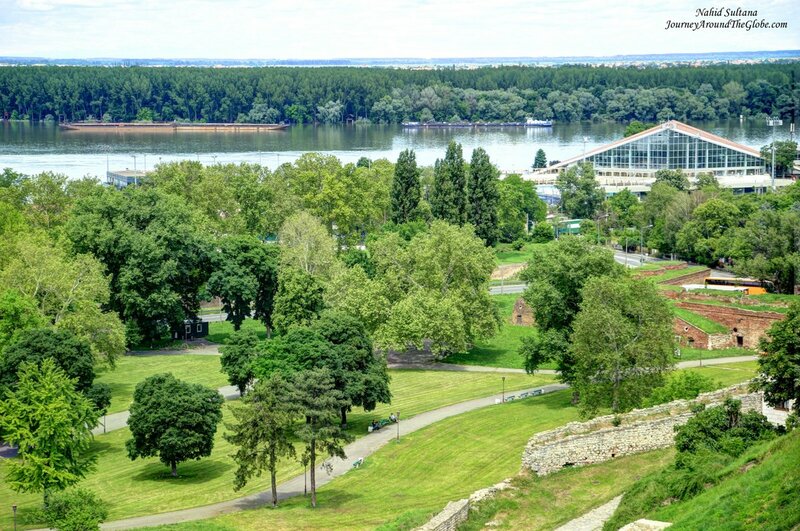 From museums, the National Museum, Historical Museum of Serbia, Museum of Serbian Orthodox Church, Gallery of Frescoes, Military Museum inside Belgrade Fortress, and Nikola Tesla Museum should be nice to tour around. 1) KNEZ MIHAILOVA STREET: This is the main pedestrian street of the city where we had our first dinner and came back again next morning. It seemed like this place is always crowded with locals, tourists, and artists. Numerous cafes, restaurants, and trendy stores (like Zara, Sephora etc.) stand on both sides of this street. 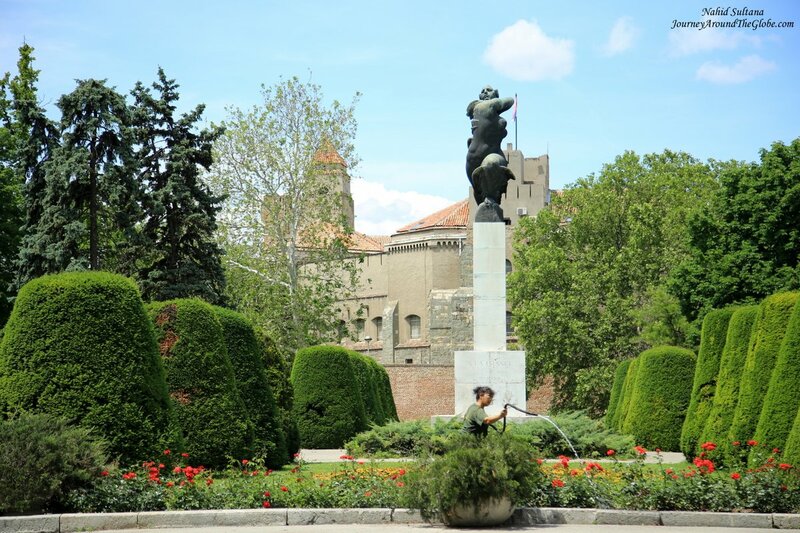 It is a long stretch of lively path with some fountains, a perfect place to start your tour in Belgrade. Monument of Gratitude to France is a sculpture at one entrance of this fortress which was erected in 1930 in token of gratitude to France for its help to Serbia during WWII. A gate thru which we entered the inner ground of this fortress, called Stambol Gate, was built around 1750. Another gate, called Karadjordje’s Gate of Kalemegdan is from the 18th century. You will also see a guardhouse from 19th century which houses the National History Museum Gallery at present time. And the Military Museum here was established by Prince Milo in 1878. The first exhibition in this museum was on the occasion of marking the centenary of the First Serbian Uprising. In the course of the first siege of Belgrade in 1718, the Austrians built a large gunpowder magazine at one section of the fortress which was a safe storage for gunpowder. Corner tower of upper fortification is from the first decades of 15th century. In the 18th century, it was the seat of fortress commander, and since 1964 it houses the National Observatory. The half-timbered looking square house is the Institute for the Protection of Cultural Monuments of Belgrade which was established in 1960, for the purposes of exploration, studying, evaluation, and protection of the cultural and historic heritages of Belgrade and of Belgrade Fortress. There is also a tomb, known as Tomb of Damat Ali Pasha “The Conqueror of Morea” who fell in the Battle of Petrovaradin in 1716. Sahat Tower (Clock Tower) can be seen from miles away and is an iconic landmark of this fortress. There aren’t much left of the original fortress. This is more like a central park of Belgrade now. Many ruins and old walls cover some portion of the complex. Overview of the confluence of River Danube and River Sava is something spectacular to see from here. Also, sunset is supposed to be a nice one from the hill, although we couldn’t watch it. It’s free to roam around the fortress ground. We didn’t go to the Military Museum; it contains old tanks and weapons. 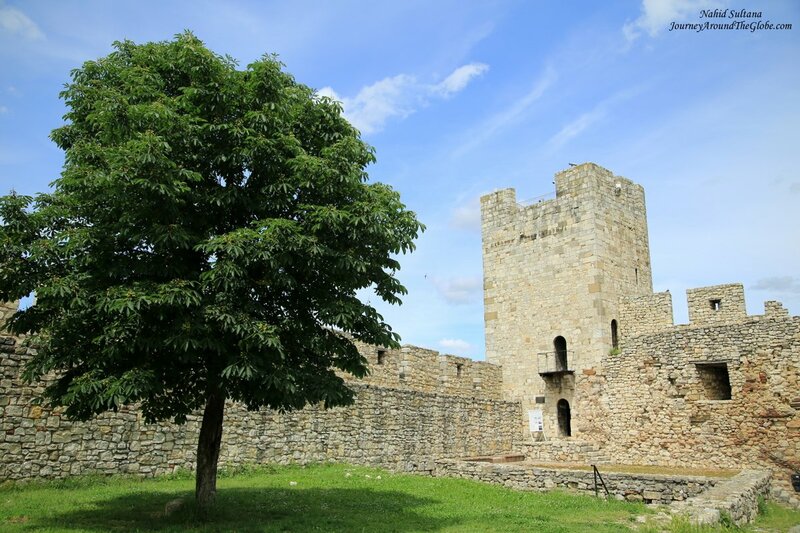 The fortress is located at one end of Knez Mihailova Street in the old part of Belgrade. There are couple entrances to the fortress. We entered from Knez Mihailova Street, you just have to keep walking straight all the way and you will be right in front of Monument of Victory near Kalemegdan. 3) BELGRADE CATHEDRALE: From Kalemegdan we started walking towards Knez Mihailova Street again and from there we just followed the crowned steeple of Belgrade Cathedral. 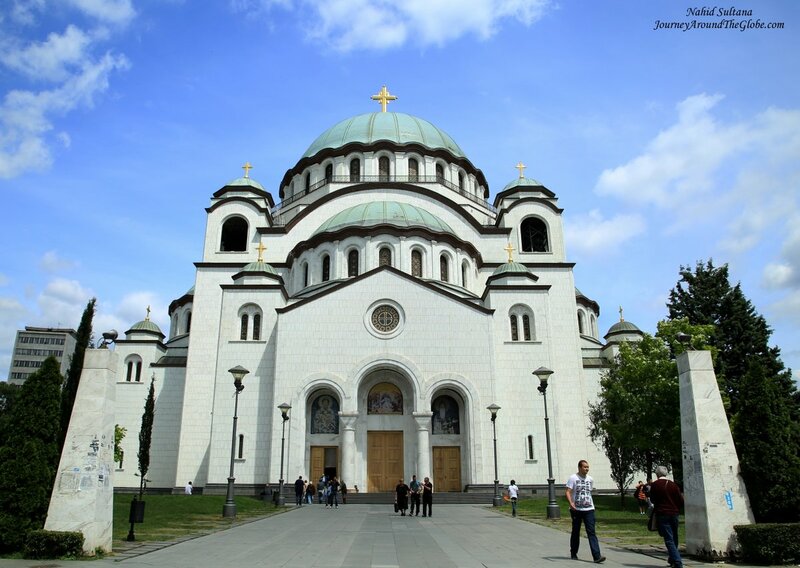 This Serbian Orthodox Church is also known as St. Michael’s Cathedral. Interior of the cathedral is very ornate and luxuriously decorated. Stained glass windows with different saints’ portraits, decorative altar, painted walls and ceilings…everything is very richly adorned. There is no charge to enter and it’s located opposite of Residence of Princess Ljubica. Taking pictures inside is not permitted. 4) REPUBLIC SQUARE: Republic Square is the main big square here, and also a meeting point. It’s on the other end of Knez Mihailova Street, opposite of Belgrade Fortress. You can see statue of Serbian Prince Mihailo Obrenovic riding on his horse back in the middle of the square. It was erected on 1882. This may be a good point to spend few hours visiting National Theater and National Museum. We were interested in National Museum but it was under major reconstruction and we were told some of its sections were closed. We didn’t go inside any of these buildings, just stayed in the square for few minutes and off to our hotel. 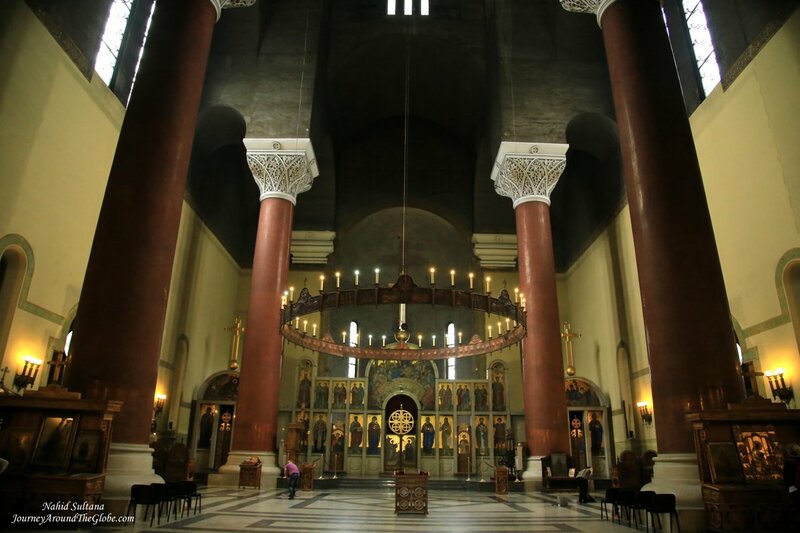 5) THE CATHEDRAL of ST. SAVA: Next day we hired a taxi and drove to St. Sava Cathedral. This is the biggest Eastern Orthodox Church in the world. The original construction started in 1935 but interior still hasn’t been finished yet. Main altar, dome, wall, floors, and ceiling are all under construction. From its outside grand look and inside glimpse of some work, you can tell that it will be something extraordinary when it’s done. Entrance was free to this cathedral. 6) ST. MARK’S CHURCH: From St. Sava, we took another taxi to St. Mark’s Church. Just like other temples in Belgrade, this one is also a recent building from 1931. It’s a nice building from outside; inside is not very ornate but the altar and high dome are pretty. There are some portraits of saints on the main altar and like other orthodox churches, this one doesn’t have any sitting arrangements for the worshippers. It’s free to enter the church. 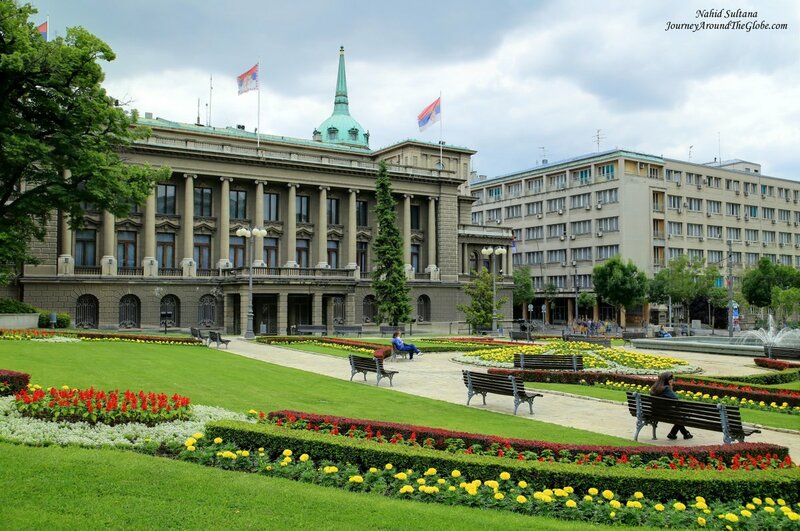 7) NIKOLA PASIC SQUARE (Old Royal Palace, New Palace, and National Assembly of Serbia): Nikola Pasic Square is a huge square that houses some of the important buildings of the city and country. Three of them are the National Assembly of Serbia, the Old Royal Palace, and the New Palace. National Assembly of Serbia and the Old Royal Palace are located opposite of each other divided by a major street in the middle. National Assembly is an elegant building with few domes at one side of Nikola Pasic Square. We saw the Old Royal Palace from the other side of its garden. Built in 1881, the Old Royal Palace is now used as Belgrade Town Hall. Beside the Old Royal Palace, is the New Royal Palace. 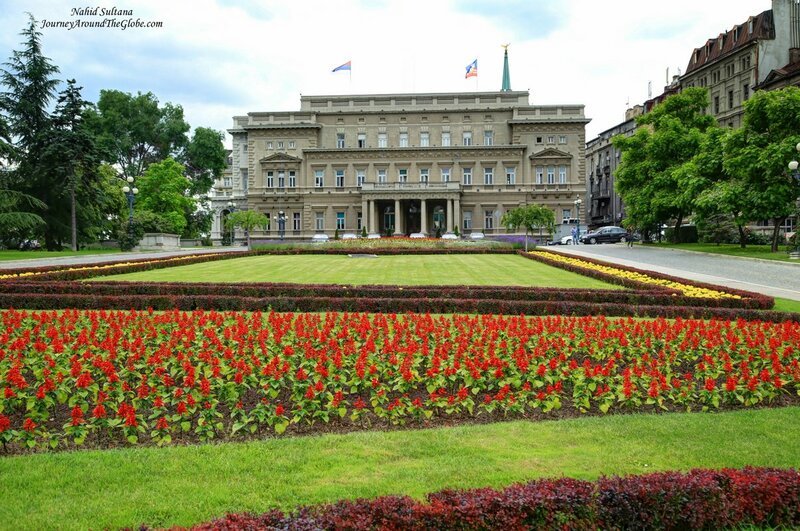 The palace was built in 1922, today this is the official seat of the President of Serbia. There is a beautifully maintained park/garden by the palace, a nice spot to sit down. 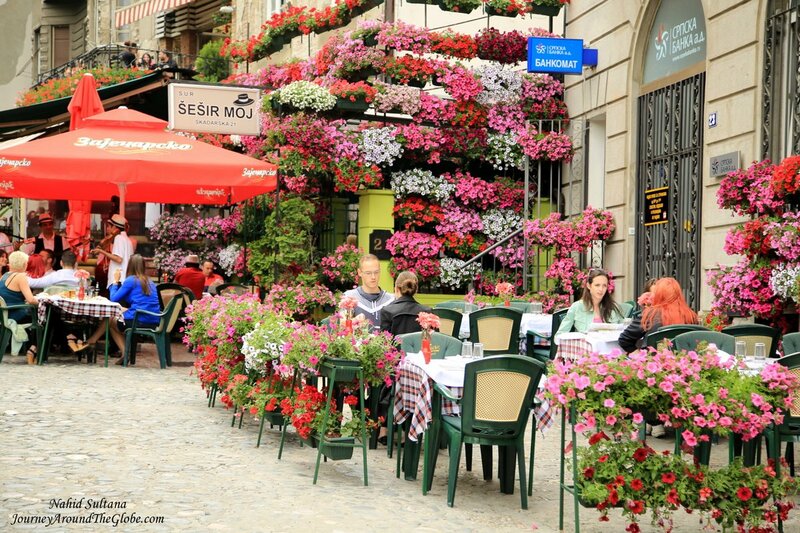 8) SKADARLIJA (Skadarska Street): Skadarlija is an enchanting 800m long pedestrian street in the old part of Belgrade. This is actually the oldest part of the town now paved with cobblestone and decorated with flower in every corner and artistic items. Filled with traditional and international cuisines and live music, this is a perfect place for meals or drink. You can find kebab, Greek style salad, and other Balkan dishes in these places. There is an old sabilj/public fountain at one end of this alley. There is a beautiful oil painted mural at one section of this street giving it an atmospheric vibe. This is a small note we saw on an information board on Skadarlija. A caricaturist/writer, Zuko Dzumhur, wrote this on behalf of the street. I think it pretty much sums up its past and present. Here it goes: “My name is Skadarlija or Skadarska Street, whichever you prefer. I am no boulevard, I am no avenue. Neither am I a highway. I am a simple, steep, winding, and poorly cobbled alley in the heart of Belgrade. And that would be everything worth saying about me if I did not have my Bohemian past and if I did not have my dilapidated roofs, rickety chairs, and an open ditch. My guests have always been famous men of letters. My first guests were Belgrade’s actors, poets, directors, painters, and writers. I have also hosted ministers and esteemed governors; I have hosted saddlers, boza sellers, kebab restaurant keepers, school dropouts, and learned professors. They all sand and partied under my roofs and on my cobble stones. And then, all of a sudden, I was surrounded by a large, noisy, million city. New, proper streets were built as well as stately mansions. Luckily, I was either forgotten or bypassed. My enemies did build several unwieldy, ugly-looking buildings on my sides in order to damage and ruin me. But my friends and those close to me, fought to preserve me and to save at least a small part of my spirit and my ancient glory. 9) MUSEUM of The HISTORY of YUGOSLAVI and HOUSE of FLOWERS: On the 3rd and last day in Belgrade we had only few hours to see some last minutes stuff in Belgrade before our flight in the evening. We were interested in knowing about the former Federation of Yugoslav…how the provinces of Yugoslavia lived their lives, their systems, why it worked, and why it broke out into pieces, what went wrong, and a history from Serbian perspective. We visited the other former federations of Yugoslavia, like Serbia, Slovenia, Macedonia, Montenegro, Croatia, and Bosnia and heard their sides of the stories. This museum really didn’t answer all our questions but it came closest to what we wanted to know. Museum of History of Yugoslavia was built in 1996. This was originally, Yugoslavia’s charismatic dictator Josep Broz Tito’s summer house. Many of his personal belongings and gifts are displayed here in different sections of this museum. Museum’s ground and the garden have many statues and fountains. The House of Flowers was built in 1975 as a winter garden, a facility for work and relaxation of Tito and his wife, in the close vicinity of the official residence where they lived. 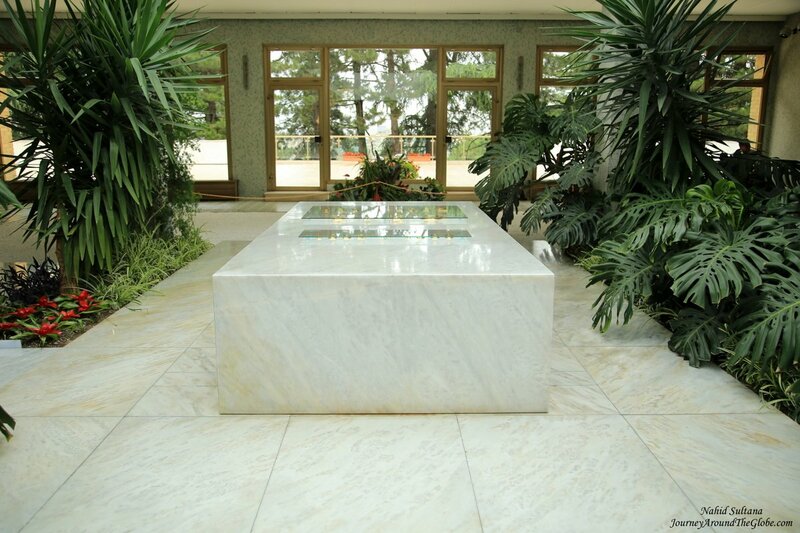 Their personal wishes were honored, and both were buried in the central area of the garden in 1980 and 2013 respectively. 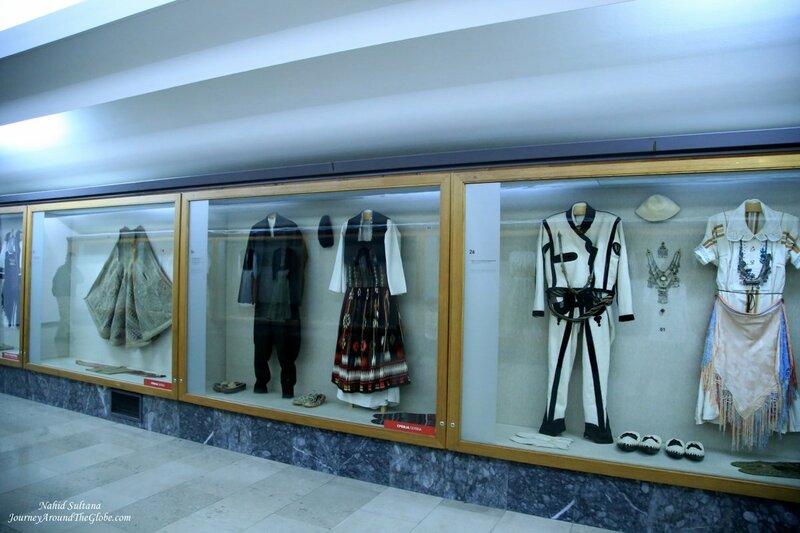 Old Museum and the ethnographic collection of the Museum of Yugoslav History has a unique collection of rarities. The permanent exhibition “Old Museum” focuses on the exclusive quality of certain items. 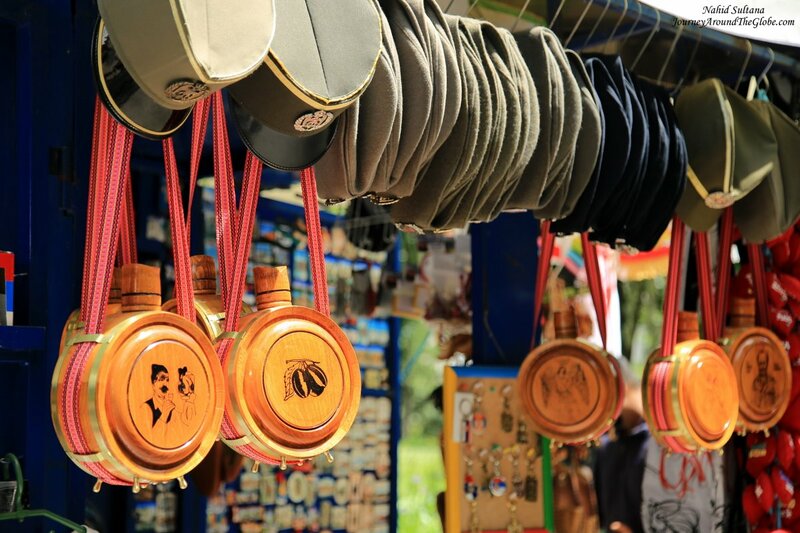 They have artifacts (like handmade weapons, traditional costumes) from the former Yugoslavia and gifts from around the world given to Tito in his years as president. This section of the museum is known as “Around the World” to emphasize the variety of origin of the items. This portion contains more than 4000 items. These include vivid national costumes (gifts from throughout the former Yugoslavia and other countries including Mongolia, the USSR, India, Burma, Ethiopia, Mexico, Chile, and Bolivia), richly decorated towels, hand-woven rugs and tapestries, folk instruments, and hand-crafted weapons from many parts of the world. The ethnographic collection also boasts a variety of handcrafts such as old carved wood chests, pipes, chibouks, spinning wheels, and a vibrant collection of dolls in national costumes. Ticket is 200 denars per adult and 100 denar for kids. We got a free guided tour with the ticket. She was a professor and took us around the garden, House of Flowers, and Ethnographic Museum as she spoke and gave us some brief information. Guide tour is available for the museum for free in English every Saturdays and Sundays at 11 am.